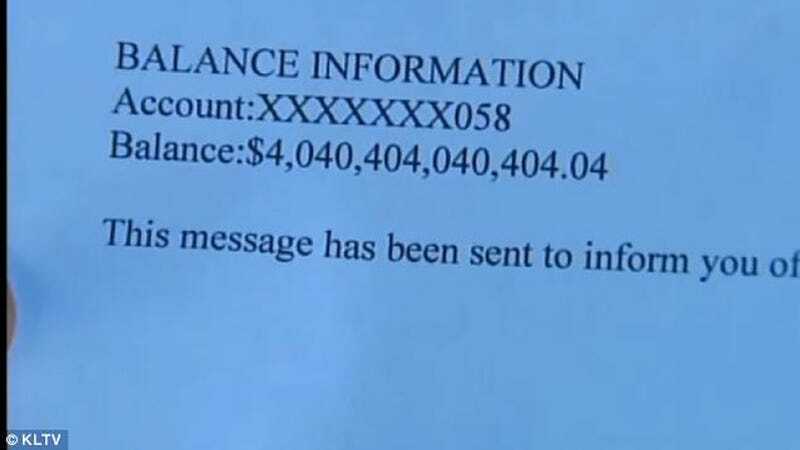 For a few brief, shining hours, one fated East Texas man become the world's very first trillionaire. And he owes it all to what may be the greatest 404 error to ever grace god's green Earth. Reggie Theus (not the basketball coach) was casually checking his bank account when he noticed something that seemed a bit off—specifically, the addition of nine usually absent digits to the left of the decimal place. Theus tells KLTV, "I was definitely surprised when I looked in my account and saw that much money in there." We bet you were, buddy. And as the new poster boy of for the modern Cinderella story, Theus selflessly decided to use his newfound wealth to pay off the national debt. No, seriously. That was his actual plan. It's just too bad his entire fortune was made up of one big error message.